Shatha Baydoun, UML's new history and modern languages librarian. Baydoun will serve as the new history and modern languages librarian for Learning & Research Services. 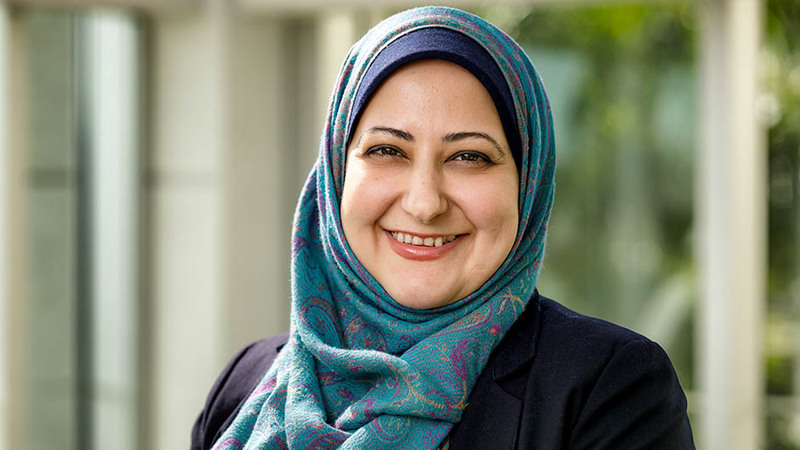 University of Miami Libraries (UML) recently welcomed Shatha Baydoun as the new history and modern languages librarian for Learning & Research Services. Shatha will act as liaison to the Departments of History and Modern Languages & Literatures in the College of Arts and Sciences. In 2018 Shatha earned a master’s degree in Information Science from Wayne State University in Detroit, Michigan, while simultaneously working at the Arthur Neef Law Library. Shatha comes to us with a significant educational and academic background in the humanities. She earned a Master of Arts in History from the University of Michigan, Ann Arbor, with a specialty in West African and Middle Eastern history. Shatha spent ten years as a history instructor at Henry Ford College in Dearborn, Michigan, where she developed and taught such courses as “World History,” “Modern Middle East History,” “African History,” and “Modern Middle East I and II.” Shatha speaks Krio, the national lingua franca of Sierra Leone, West Africa, where she was born and raised. She is also a native Arabic speaker and writer. Her current research interests include the various ways libraries, museums, and archives design metadata for Arabic and Islamic cultural artifacts. Shatha Baydoun can be reached at sbaydoun@miami.edu.